Taipei, Dec. 14 (CNA) Now is the optimal time for Taiwan and France to further strengthen industrial investment and technology exchange and cooperation, said President Tsai Ing-wen (蔡英文) as she received a French delegation Thursday. She added that now was perfect timing because France is currently promoting its "Industry of the Future," the second phase of its reindustrialization plan, while Taiwan is focused on its "5+2 Industrial Innovation Plan," which seeks to move the country in the direction of innovation and job creation. One very important area of shared interest is technological cooperation, said Tsai as she explained that Taiwan invests more manpower and resources in terms of these types of relations with France than most other countries. 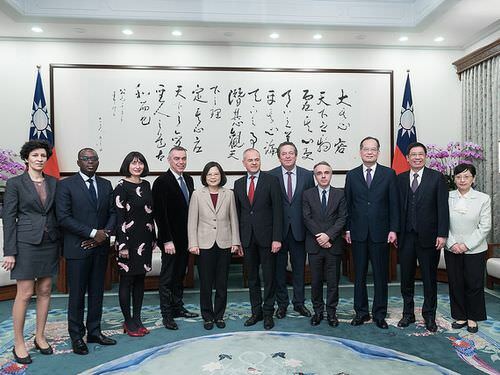 The delegation, which was led by Jean-Francois Cesarini, head of the French Senate's Taiwan Friendship Group, included Jean-Jacques Gaultier, deputy head of the group; Bureau Français de Taipei Director Benoît Guidée and senators Jacques Cattin, Laurence Trastour-Isnart and Jean Francois Mbaye. "I can assure you all, the more you visit, the more you will like Taiwan," said Tsai after learning how much Cesarini likes Taiwan. 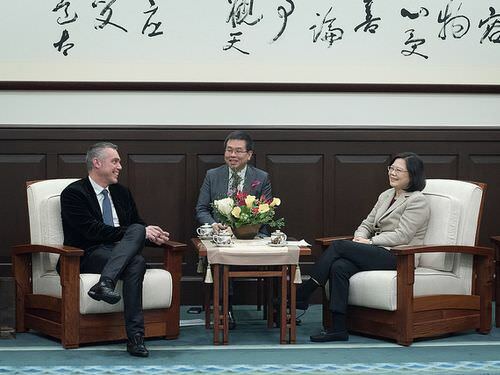 Over the last two years, exchanges between Taiwan and France have been frequent with many Taiwanese officials visiting France to discuss bilateral cooperation between the two countries, said Tsai. France is a leader in industrial and scientific fields, especially in aerospace and green energy technology, and is a key force driving the world forward, said Tsai. France's efforts in the fields of humanities and art as well as its practice and defense of democratic freedom has had a lasting impact on the world, said Tsai, noting that France and Taiwan share the common language of democratic values. 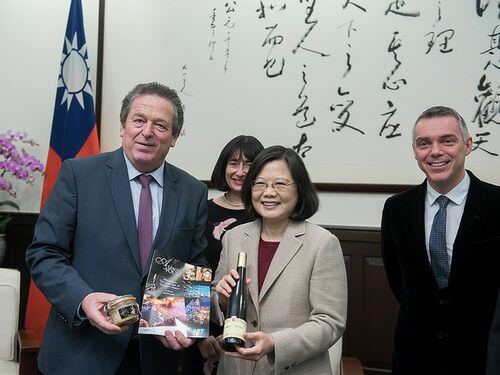 France is Taiwan's fourth largest trading partner in Europe, with US$4.6 billion in trade last year. At the same time, the revision of bilateral aviation agreements means that flights between Taiwan and Paris have also increased, said Tsai. The Taiwanese people, being part of the global community, would like to make more contributions and are very much looking forward to being part of global developments, said Tsai. As such, it would be extremely helpful if France could support Taiwan's aspirations to be part of the Paris climate agreement, participate in the United Nations Framework Convention on Climate Change or have access to Interpol in Lyon, to work with countries around the world to combat transnational crime, said Tsai.